Changing Which Inactive Icons to Hide or Display? Past Items – Icons previously visible in the Windows XP or Vista Taskbar Notification Area. These icons may refer to software not currently running, USB devices not currently plugged into the machine, networks to which you are not currently connected, and more. 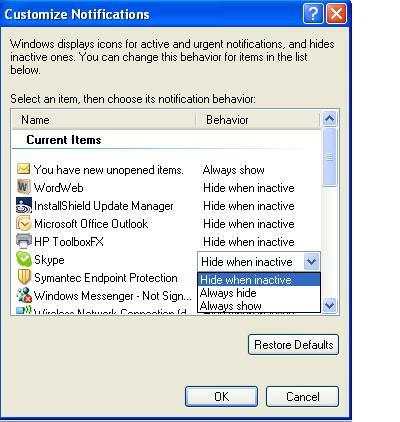 Hide when inactive – (default behavior) Windows XP or vista will hide the taskbar icon when it deems it is not being used. Always hide – Windows XP or vista will keep the taskbar icon hidden except for when you click the “Show Hidden Icons” button. Always show – Windows XP or vista will keep the taskbar icon visible whether it is being used or not. ¨ Step3: Under Performance Settings check “Adjust for best performance” in Visual Effects. Do you want to change your wallpaper every 1 min? Step 3 : Set the timer and other options as you want. Now the desktop frequently changes its wallpaper.